Older gas powered lawnmowers can develop engine and idle speed problems. Idle speed problems mean an engine running too fast, too rough or easily stalling. 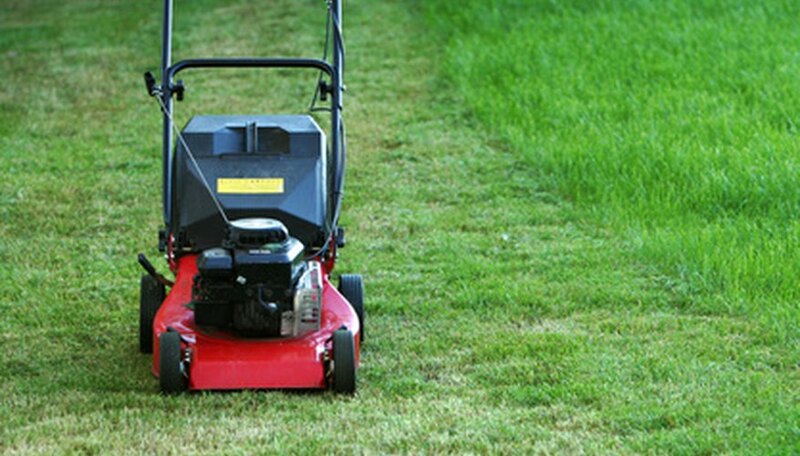 By checking a few key things on your lawnmower, you can fix the problem. If not, it will give you a better idea of what is wrong with the machine. Troubleshooting your lawnmower only takes a few moments. Switch off the lawnmower. Turn the mower on its side, and look at the blades. Make sure nothing is clogging the mechanism or preventing the blades from turning. If the blades are restricted, it will affect how the engine runs. Wet grass and sticks can become caked around the blades. Carefully scrape off any excess debris. Check the choke. Some models of lawnmower are fitted with a manual choke system that adjusts the mixture of air and fuel in the engine. The choke is pulled to its maximum when starting a cold engine, but should be pushed back to neutral once the engine is started. An incorrect choke set-up can cause the engine not to start, to stall or to run roughly. Check the throttle cable. The throttle is used to rev the engine and speed up the blades during use. If the cable has slipped or come loose, the engine may not idle or run properly. Check the fuel cut-off switch. Some lawnmowers have a cut-off switch to prevent children from starting them or for keeping the mower in storage. If the fuel cut-off switch is on, the engine will not start or may only run for a few seconds. Call a professional. If none of the above steps solve or give a clear indication of the problem, you may need to call a professional repairman. Look in your telephone directory for a suitable shop. Always shut down your mower before inspecting the blades. Use caution examining your mower if it has been running; parts may be hot.